Back Pain: Prevention via Core Strength - Center for Pain Medicine, P.A. While most people suffer some back pain in their lives, fewer people embrace elementary strategies to prevent the occurrence or recurrence of such pain. While most people suffer some back pain in their lives, fewer people embrace elementary strategies to prevent the occurrence or recurrence of such pain. With a few simple exercises everyday, you can strengthen your core muscles to stave off future injury. Your core muscles are the muscles of your torso, which exclude arms and legs. While it’s not important to name the muscles, it is important to understand that they include not only those visible to the eye on the “outside” of the body, but also muscles that are deep “inside,” stabilizing your spine, pelvis and stomach. Activating and strengthening these muscles can help your balance and posture, as well as decrease the possibility of future injury. Core muscle exercises can be done at home with minimal space on a towel or yoga mat on the floor. The first strategy to be mastered is activating abdominal muscles. Lie on your back with your knees bent. In this position you feel the small of your back slightly off the ground. While exhaling, press your stomach to the floor, so that all of your back is touching the ground. Feel the tightening of the stomach muscles, but do not tilt your hips. Continue to breathe normally; don’t hold your breath. Practice this position, as it is the beginning of many other exercises. Core stabilization training can also be applied to daily activities. For example, while walking, assume a neutral posture and try to pull your belly button into your spine. 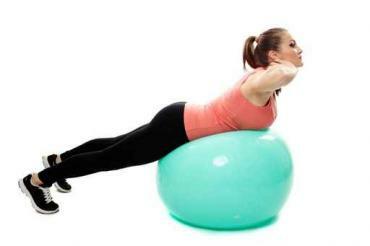 While sitting at your desk, exchange your chair for an exercise ball. Stretch and do “Superman” exercises before getting out of bed in the morning. At the office, take the stairs instead of the elevator – and be sure to engage your abdominal muscles! With a modest effort in integrating these core exercises into your daily routine, you should feel results in the form of increased stability and decreased pain in a short time. Graduate from “Superman” to press-up, yoga boats and planks for a tight core that will prevent future back pain!